When it comes to pasta, a lot of people, myself included, would rather go for the quick and easy 5-minute Barilla capellini from the supermarket. On the off-chance you have an hour or two to make dinner, you should really consider making fresh pasta. It takes a little bit of time and effort but isn’t very difficult at all and tastes so much better than store-bought pasta. Once you get the basics of making fresh pasta, you can start experimenting like herb pasta, pumpkin pasta, spinach pasta, squid ink pasta, you name it! Let’s take a step back and start with the basics first. * the conversion comes out a bit funny, so for simplicity you could also use 1-1/4 cup AP flour and 3/4 cup of semolina. Rule of thumb is one egg per one cup of dry flour, so we’re looking for 2 cups total between the AP flour and semolina. There’s a few ways you could do this but we’ll explain the “well” method here. If you have a stand mixer you could throw all the ingredients in and voila! Using a food processor would require some more attention to make sure the dough doesn’t get too dry and cause it to smoke up like ours did. We learned the well method from a cooking demo with the New School of Cooking at Eat Real Fest, and it works best for us. First mix the semolina and all-purpose flour together in a large bowl. For this next step you could choose to use a cutting board but we like using the bowl because we tend to make a mess of things. 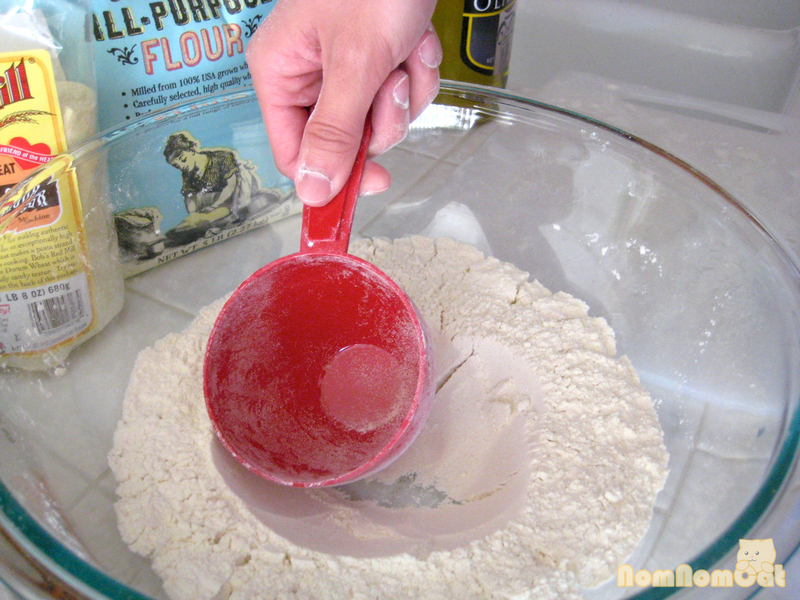 Form a well with the flour mixture using the bottom of the dry measuring cup you used for the flour. Crack both eggs and put them into the well along with a pinch of salt, drizzle of olive oil, and, if you’d like, some basil or other dry herbs. We used extra large eggs but if you use smaller eggs or larger eggs remember to adjust accordingly because 2 extra large eggs was just the right amount of moisture for the amount of dough we wanted to make. With a fork, break the yolks and begin mixing the ingredients in the well while slowly incorporating the flour mixture in a circular motion. Try to maintain the integrity and shape of the well to avoid mixing in too much flour all at once. It’s easier to use mix in less flour and add more if it turns out sticky than to need to add water or olive oil later if it became too dry. 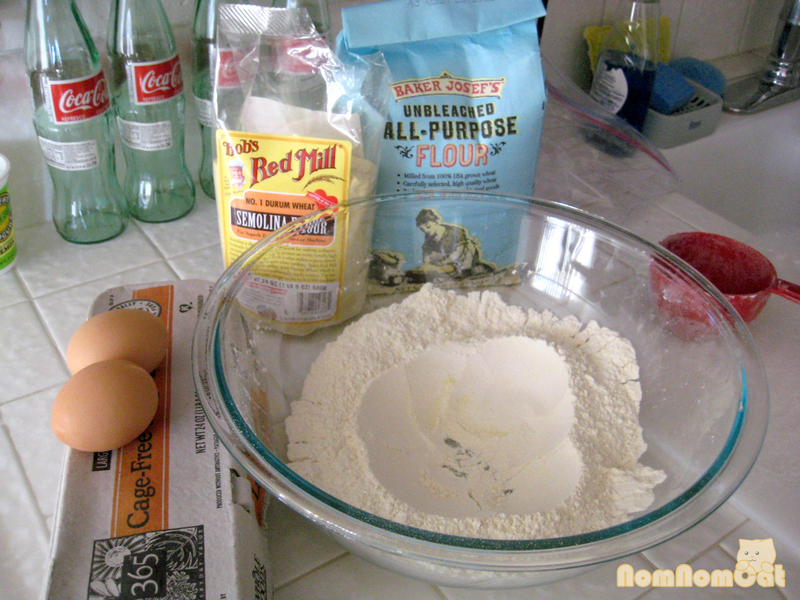 Continue mixing the ingredients together until you get a nice lump of dough. When the dough is no longer sticky, jump in with both hands and begin kneading the dough with your palms on a cutting board sprinkled with flour. 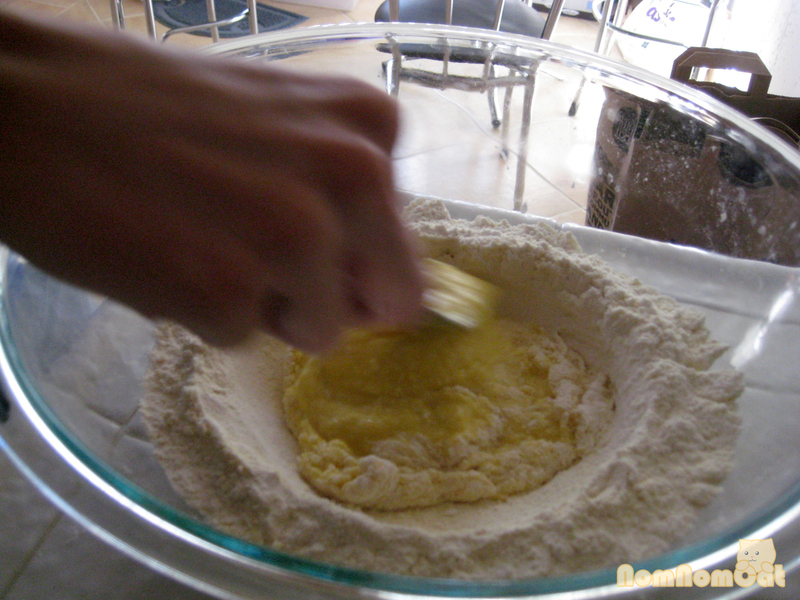 Knead the dough out, rotate it a quarter-turn, fold it over, and knead again, adding flour as needed if still sticky. Knead for about 5-10 minutes to get the gluten proteins working. Put the lump of dough into an unsealed Ziplock bag and let sit on the counter for 40 minutes. If you’re in a rush, you can go as short as 20 minutes, but ideally you want to let it rest for 40 minutes to an hour. After 40 minutes have passed, take the lump of dough, roll it out with a rolling pin, and cut it into 4 equal pieces. (Tip: you’ll want the pieces to be more narrow than wide so that it doesn’t stick to the edges of the pasta maker.) You’re all set! You could choose to make cut pasta, shaped pasta, filled pasta.. even leave the strips whole and make lasagna. 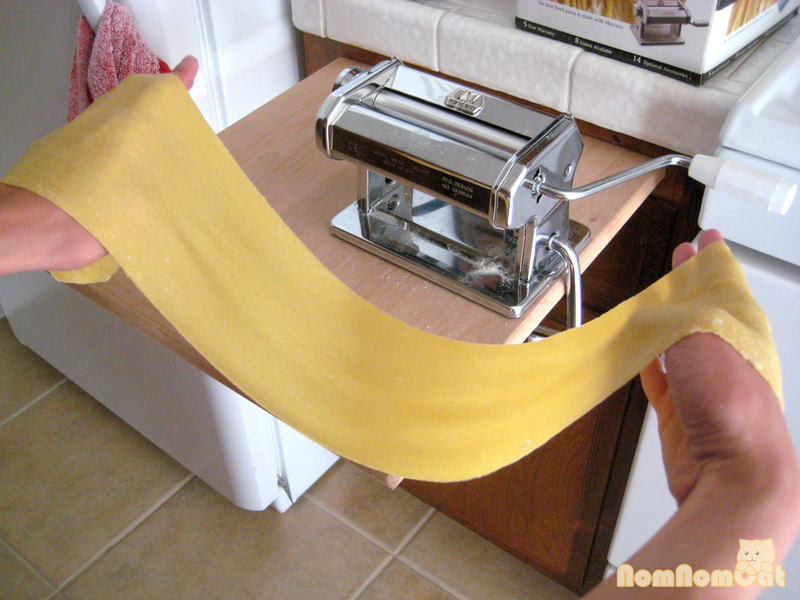 We haven’t quite tried shaped pastas yet so read on for instructions on “string” or cut pastas. 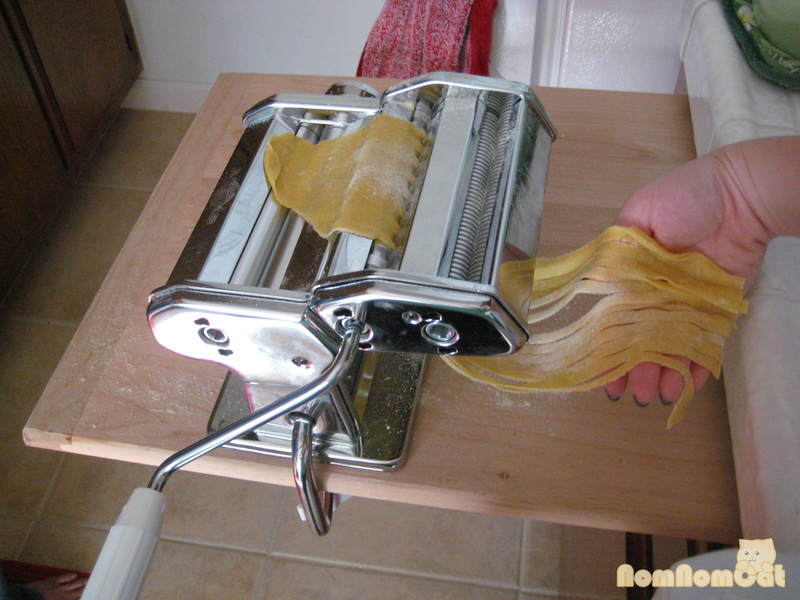 To roll the pasta, we use a Marcato pasta maker, see link here for info about it. Set your pasta maker to the 0 setting and run the dough through it. Fold the dough over on itself in thirds (like you’re folding a brochure) and run it through the machine again. Repeat this 2-3 times until it has produced a consistent thickness. Change the dial to 1 and run the dough through once. Continue changing the dial to higher numbers and run the dough through once each time until it reaches the desired thickness. For spaghetti on the Marcato machine, we roll up to the thickness setting 6 and angel hair about 7 or 8. The higher you go on the setting, the thinner the pasta, and higher chance of it falling apart during cutting. After rolling each piece of dough, cut the lengthy piece in half and place on top of a baking pan lined with saran wrap and let sit. You can stack layers of saran wrap on top and repeat this step until all the dough has been rolled. 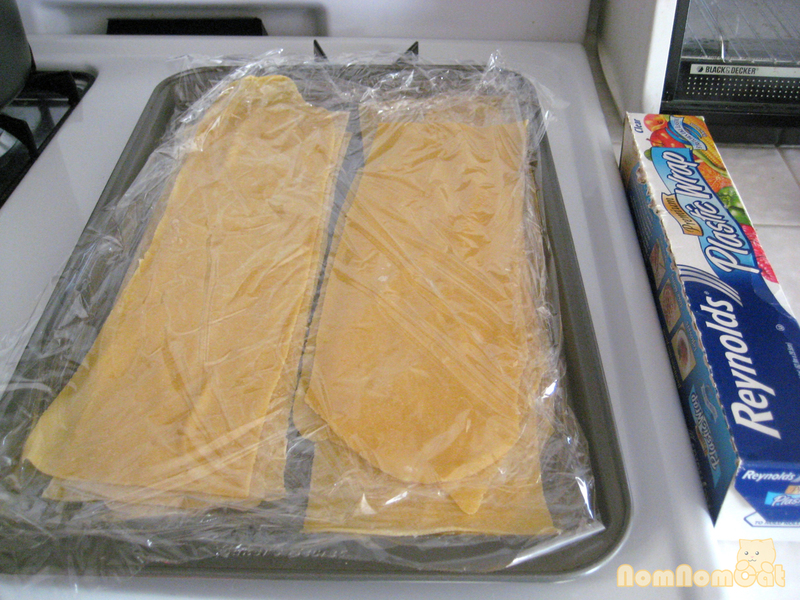 The saran wrap keeps the rolled pasta from drying out while you finish up the rest of the dough. Be sure to keep the baking pan in a cool place! We once left it our stove (which is constantly warm because of the pilot light) and the bottom layer turned out to be unusable mush. The cutting of the pasta really just depends on your preference. The Marcato pasta maker comes with default cutting heads for fettucine and tagliolini. Additional heads could be bought separately for about $30-$40. For all intents and purposes, these two attachments with varying thicknesses should suffice. Peel off one of the rolled pieces of dough from the saran wrap. If it is too sticky, liberally sprinkle with all purpose flour. Excess flour will just flake off into the water later, but the cutting heads will not make clean cuts if the dough is too sticky. Roll the pasta through and make sure to catch the strands as they come out from the opposite side. 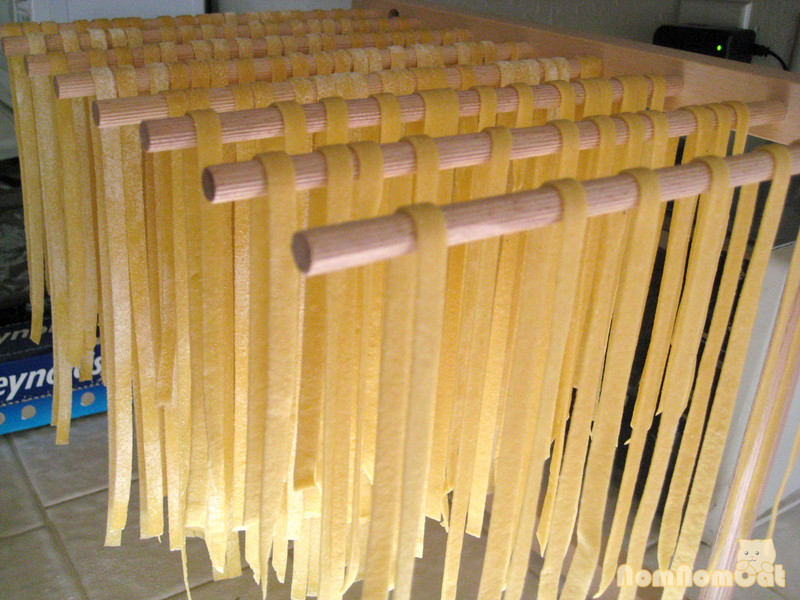 Lay the pasta on a drying rack to dry before cooking or storage. 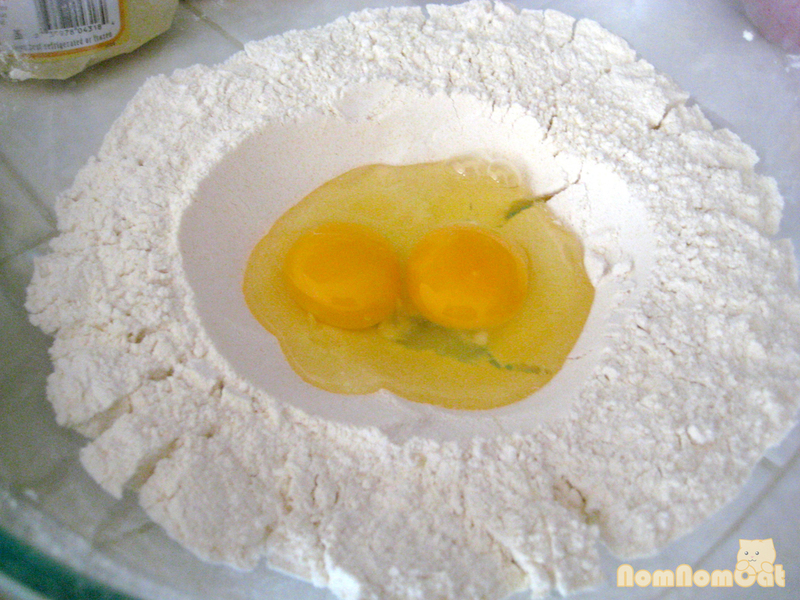 Space out the strands, dusting on extra flour if you have to, to ensure that the pasta does not end up in one big mass. The pasta is best if consumed in the same day, so if you are using the pasta right away, you’ll want to let it sit on the drying rack for at least 10 minutes or so before dropping them in salted (or oiled) boiling water. Fresh pasta takes considerably less time to cook than the dried stuff in the box, so taste taste taste! When it is al dente (approx 2-3 minutes for capellini, 5-6 minutes or so for fettuccine), drain the pasta, toss in sauce, and serve immediately. You definitely need to dress the pasta shortly after draining in order to avoid clumping. If you have leftovers or would like to keep the pasta for later, it keeps for about 3 days in the refrigerator in an airtight ziploc bag. Let the pasta dry on the racks for an hour or so and gently pack them in the bag so that the strands do not break. Freezing is not recommended, and drying on the rack will not dry the pasta sufficiently for long-term storage like the grocery store brands. We hope this little guide will help you get started in your pasta making adventures. It may take some time and a few attempts to get the right texture and consistency in fresh pasta but it will definitely be worth the hassle. If you have time during the week, definitely consider making fresh pasta. We, however, still often make Barilla during the week for convenience’s sake (for shame, yes). Now that the basics is covered, it’s time to experiment with different sauces but will post them here as we do! I really like the fresh pasta recipe. Step by step pictures are clear and beautiful. Good work and thank you for the posting! Very nice first post! And I love that you started off with the basics – homemade pasta. Great pacing with the paragraphs with good photos to illustrate. Can’t wait to test out your pasta recipe! Dying to get a machinee!